An iron tea pot sits atop a small wooden stool, placed in the centre of an upside down wooden table. Jolly Elizabethan music fills the space as the audience assembles. This is the stage set at Red Sandcastle Theatre, a minimalist design about to contain a world of magic, plots and Shakespearean homage in Socratic Theatre Collective’s production of Terry Pratchett’s Wyrd Sisters, adapted by Stephen Briggs and directed by Socratic Theatre founder/A.D. Liz Bragg. The play Terry Pratchett’s Wyrd Sisters is an adaptation of the sixth novel of Pratchett’s Discworld series; Socratic Theatre has previously produced adaptations of Terry Pratchett’s Mort and Terry Pratchett’s Monstrous Regiment. Sadly, Pratchett died on March 12 – and his work has had a profound effect on the company, so Socratic Theatre is dedicating this production of Wyrd Sisters in his memory. And if the audience’s delighted reaction is any indication, they’ve done him proud. Scheming nobles. Travelling players. Three witches. Regicide. A secret foundling whisked away to safety. A professionally frustrated and ethically conflicted Fool. Love. This play has it all. Drawing inspiration from Shakespeare’s work, particularly the Scottish play, with shades of Hamlet, Wyrd Sisters is a good fun adventure with a great comic sensibility – and a very fine cast. The three witches are a treat: S.R. Kriger as the wry-witted, resourceful (often outside the box) Granny Weatherwax; Amanda O’Halloran as the small of stature, but scrappy and irreverent, Nanny Ogg; and Madryn McCabe as Magrat Garlick, the bright and lovely young rookie who’s big on theory, but green on experience of both witchcraft and the world in general. The three men in the cast play multiple roles, male and female, to great effect. Daniel Cristofori is hilarious as the grasping, but ineffectual and neurotic Duke, as well as the less than evil demon WxrtHlt-jwlpklz. Basel Daoud does an excellent job juggling such varied characters as the plotting, power hungry Duchess and the dim-witted, shifty-eyed Sergeant. And Michael Lake is particularly adorable as the awkward and conflicted young Fool, torn between his duty to the usurping Duke and doing what’s right (and his love of a certain young lady). 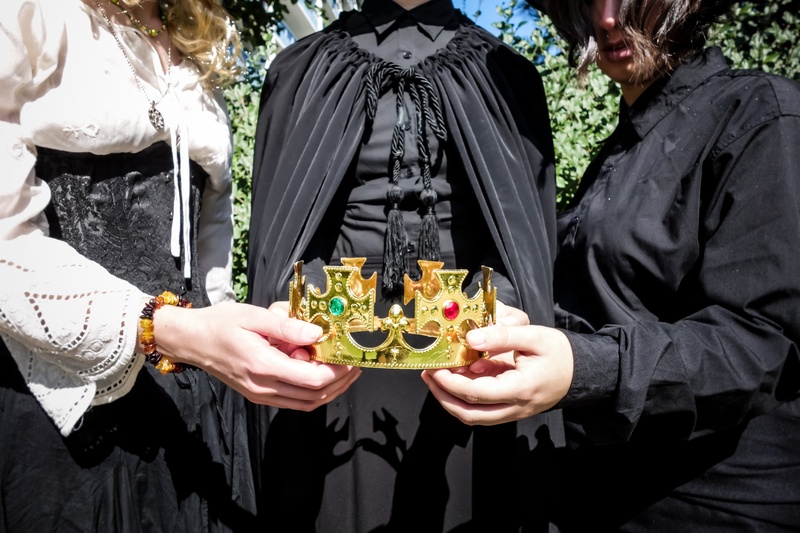 Among all the scheming, magic and Shakespearean shenanigans, Wyrd Sisters highlights the power of words and reminds us of the importance of taking an active role in one’s destiny. Fantastic use of mask (for the players’ play within the play) and mask-based puppetry (demon, ghost of the King), which capture the fun, imagination and wonder of this story – with shouts to the design team of Bragg, David Galvin Heppenstall, Jennifer Jakob, Kriger and O’Halloran. Shouts also to make-up artist Liz Davies and Chris Warrilow/Fantastic Creations for the props. It’s wicked big fun playing with Shakespeare and three good witches that rawk in Socratic Theatre Collective’s production of Terry Pratchett’s Wyrd Sisters. So get yourselves out to Red Sandcastle Theatre to see this. Wyrd Sisters runs until March 29. You can purchase tickets at the door or in advance online. You can also keep up with Socratic Theatre on Facebook and Twitter. Department of Corrections: The previous version of this post credited the photo to Amanda Irwin/Elemental Photography. The promotional photo included in this post is by Heather Corner; this has been corrected. Amanda Irwin did the production photography. You only have a year left to live. What would you do? 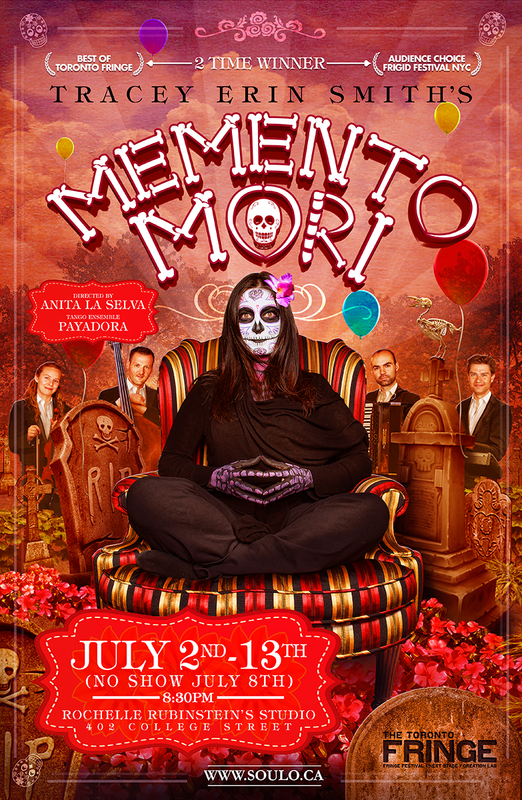 Tracey Erin Smith and SoulOTheatre present Smith’s one-woman show Memento Mori – directed by Anita LaSelva, and featuring Tango ensemble Payadora and two male dancers – running during the Toronto Fringe at Rochelle Rubenstein’s Studio (402 College St.) from July 2 – 13 (no show July 8). Using mask, dance and Toronto’s foremost 4-piece Tango ensemble, Payadora, the audience goes on a voyage through the last night of Tracey’s life. 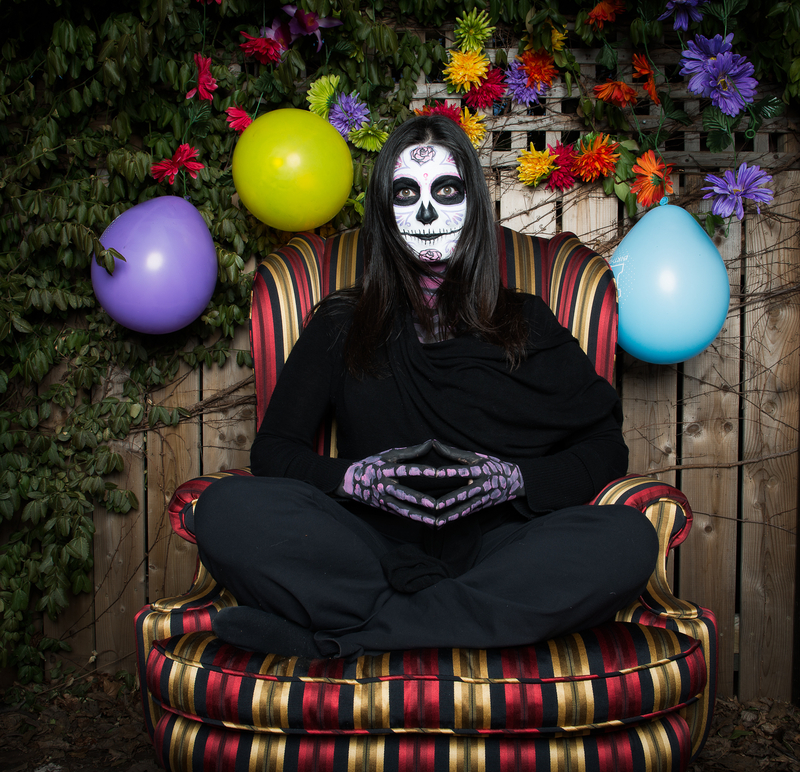 Exploring the universal themes of life, death, and magic mushrooms, Memento Mori (Latin for ‘Remember you are mortal’) is staged as a private party in a backyard and then inside a gallery space on College Street that was once used as a synagogue. 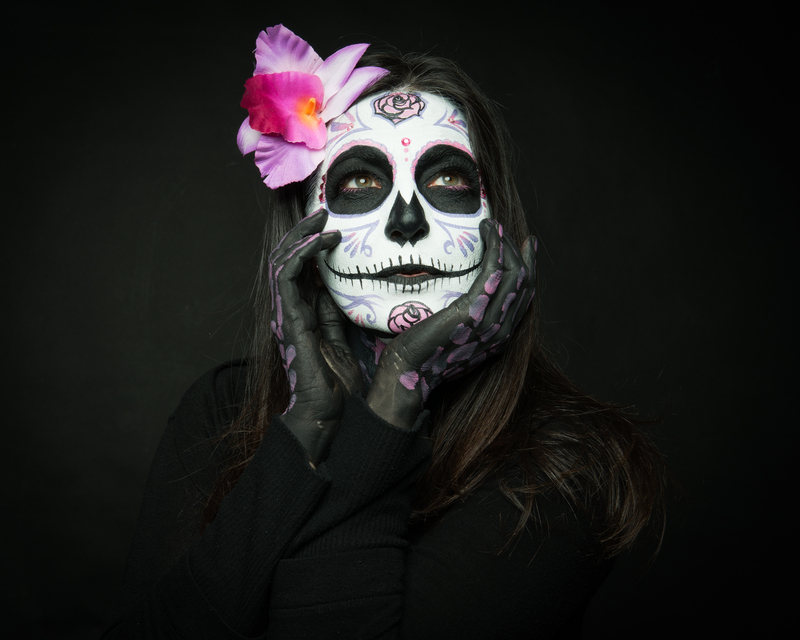 On her last night on earth, Tracey invites the audience to passionately explore the idea of fully living, while you’re still alive and to participate as much or as little in this Day of the Dead themed celebration as they desire. 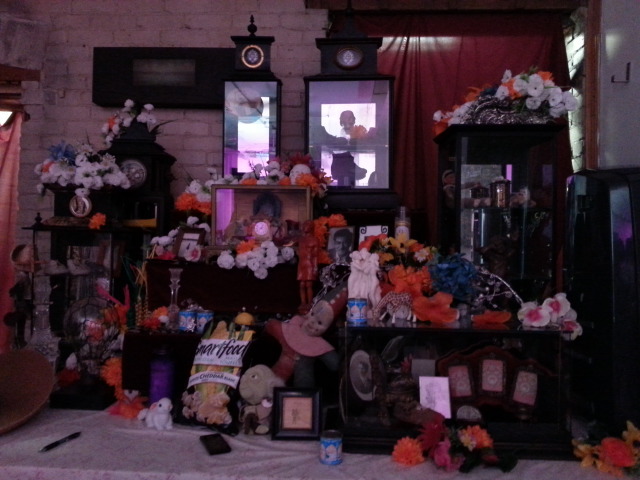 Part garden party, part death ritual – Memento Mori promises to be the best last night of anyone’s life ever! I’m definitely going to be there. How ’bout you?